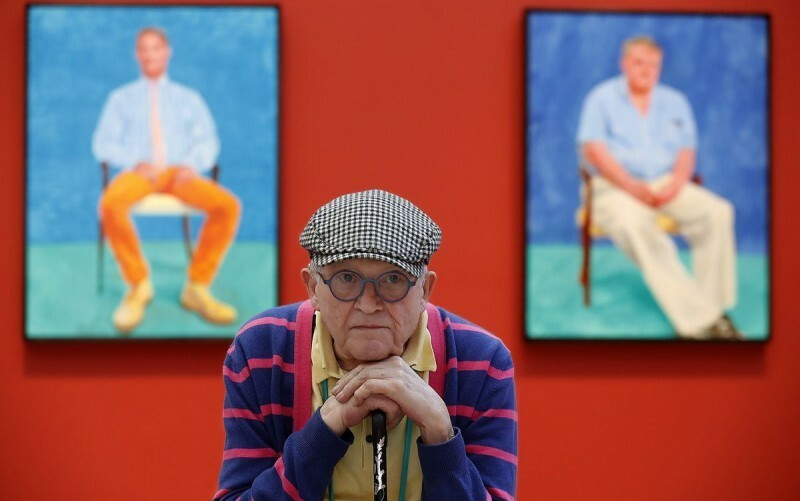 In 2018, David Hockney became the most expensive living painter in the world. In his 60-year career, the artist has developed a unique style over the decades, becoming a star of contemporary art. David Hockney was born in 1937 in Bradford, England. He created his first works at the city's school of fine arts and was inspired by social realism and the Kitchen Sink movement, which often portrayed young men disillusioned with society. In 1959, he joined the Royal College of Art in London. He discovered the works of Alan Davie, Jean Dubuffet and Francis Bacon. From that time on, he relied on two major sources: Matisse for color and Picasso for experience. Life Painting for a Diploma, David Hockney. 1962. Photo: Yageo Foundation © Yageo Foundation. 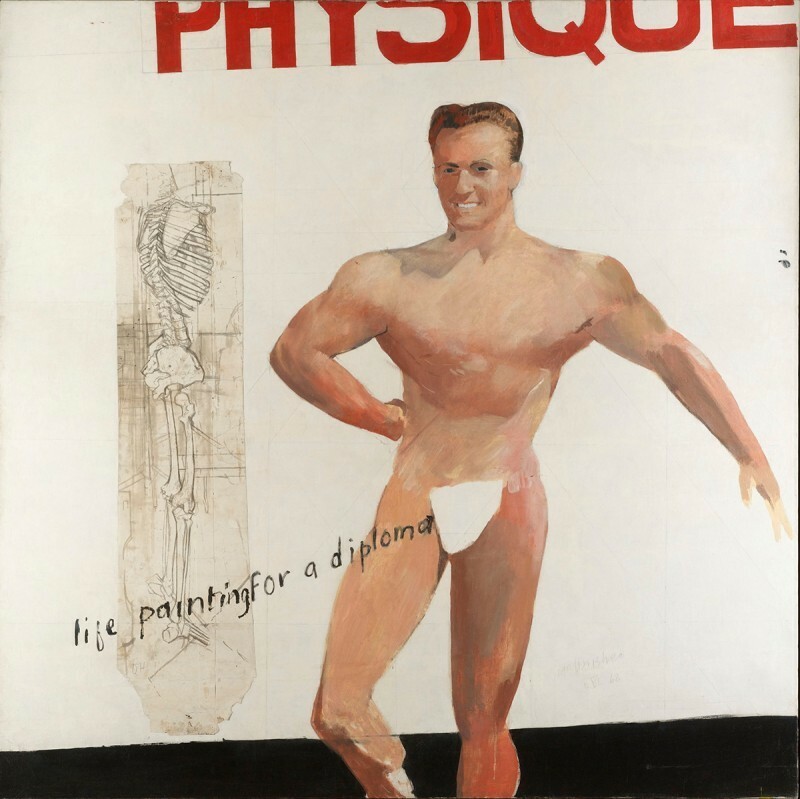 In his Propaganda Paintings and Love Paintings, he became an activist for homosexual causes, a theme that would current throughout his life. At the exhibition “Young Contemporaries” in 1961, he presented four paintings inspired by Pop Art and Abstract Expressionism, which established his characteristic style. But the real turning point came in 1964. 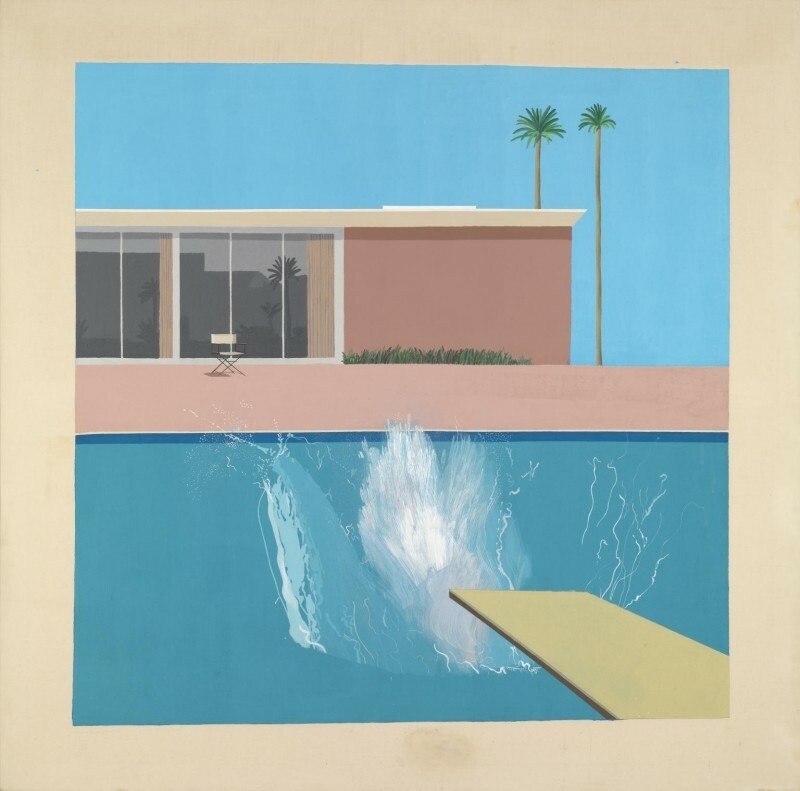 Attracted by the American dream, Hockney moved to California. The contrast of sunny Los Angeles with the industrial grayness of Yorkshire was immediately transcribed in his work. Acrylic paint invaded his surfaces as a reflection of the blinding mirages of the American lifestyle (body worship, money, moral liberalization). Hockney painted swimming pools in Hourloupian shapes unfolding in the style of Mark Rothko’s color field paintings (Bigger splash, 1967). A Lawn Being Sprinked, 1967. His paintings were then divided into two tendencies: the experimental “Technical Pictures” and the narrative “Extremely Dramatic Pictures”. 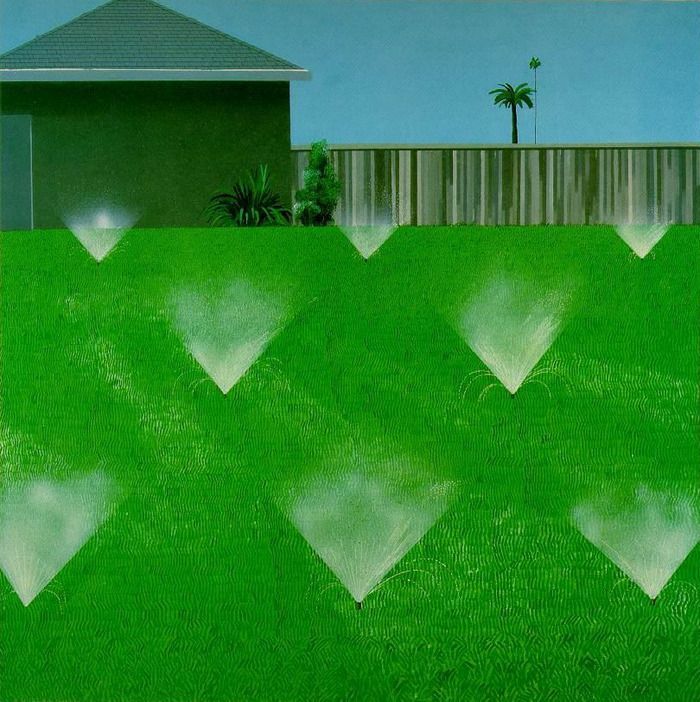 Color dilution sometimes reached extreme levels, while building facades and cut grass surrounded the contours of a minimalist lifestyle (A Lawn being sprinkled, 1967). 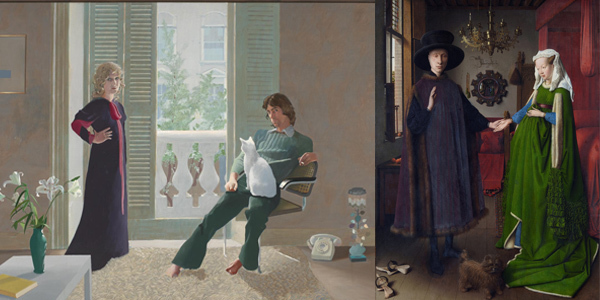 In 1968, Hockney embarked on a series of large double portraits recognized as masterpieces of modernity. In Mr and Mrs Clark and Percy (1971) he returned to the tenets of classicism and was inspired by The Arnolfini Portrait of Jan van Eyck (1434). Hockney also entered the the world of the theater by designing sets and opera costumes for Igor Stravinsky’s plays. In the early 1980s, Hockney explored photography. He conducted research on Picasso and Asian art and pursued metaphysical readings. Nichols Canyon (1980) summarizes the application of these fields of expression with vivid color palette, painterly strokes and abstracted landscape. 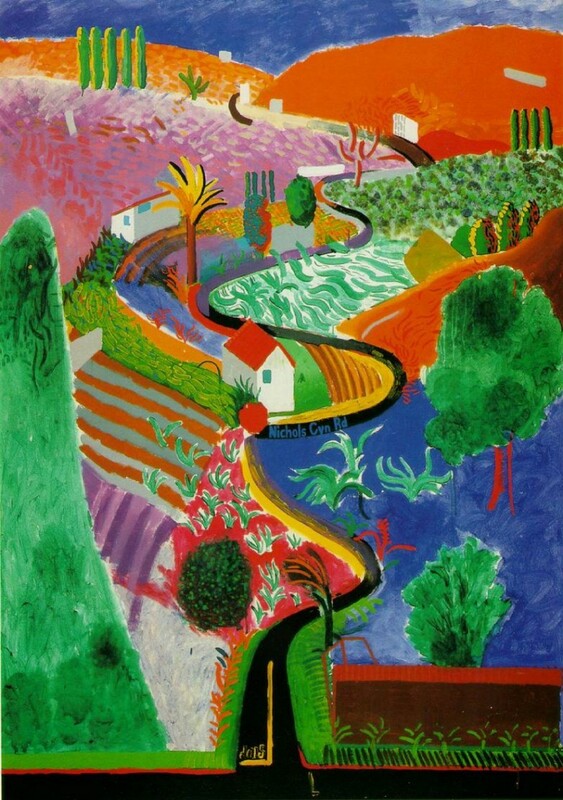 In the 1990s, Hockney returned to England. He painted the countryside of his childhood and composed photographs on the theme of the four seasons. In one of his best late paintings, Birth, Copulation and Death (1997), he illustrated a verse in a poem by T. S. Eliot titled Fragment of an Agon. The trapezoidal format is reminiscent of the altarpiece panels painted by the old masters. His artistic vision exploded into monumental formats that were an ode to nature. Bigger Trees near Water (2007) is an assembly of several canvases, designed using computer technology. Fascinated by new technologies, Hockney exhibited creations made on the iPhone in 2009. Hockney's work has been celebrated in multiple retrospective, including a large-scale exhibition organized in 2017 by the Centre Pompidou, the Tate Gallery and the Metropolitan Museum that brought together 160 works by the artist. 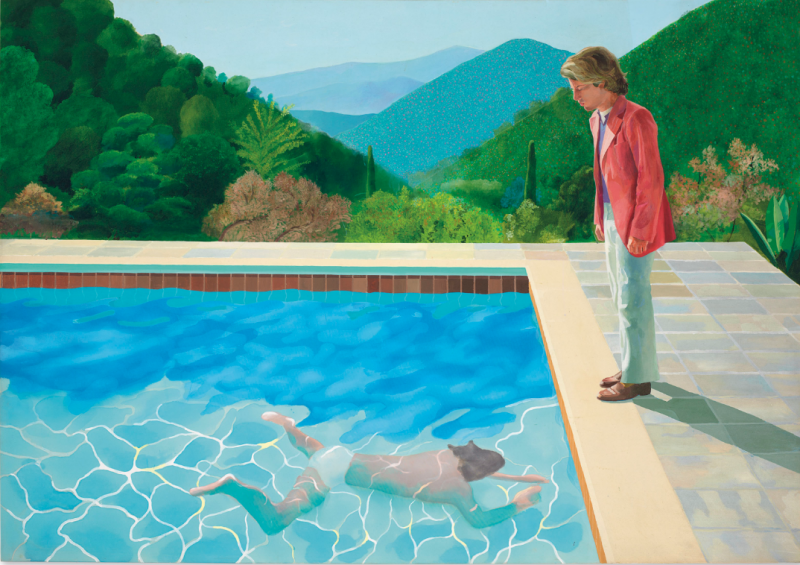 Finally, on the market side, Hockney is now king. He dethroned Jeff Koons as the most expensive living artist in the world after the sale of his Portrait of an artist (Pool with two figures), painted in 1972, that sold for $90.3 million at Christie’s New York. 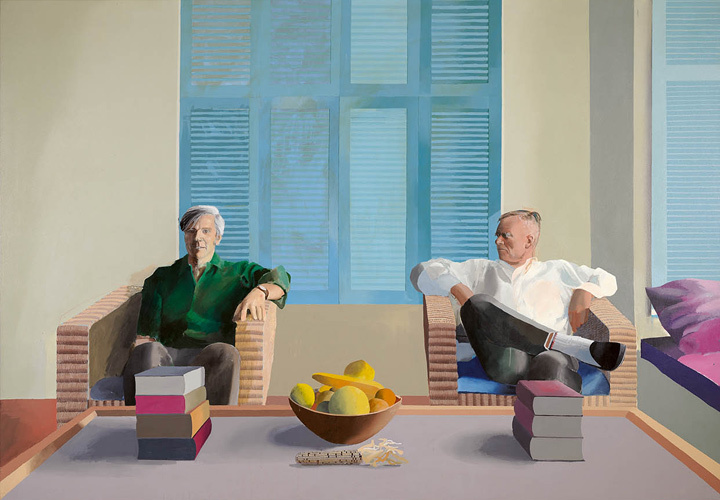 This March, another one of Hockney's works, Henry Geldzahler and Christopher Scott, which was once part of Barney Ebsworth collection, is highly anticipated in the Christie's Post War and Contemporary Art sale in London. Hockney's extraordinary oeuvre that includes paintings, drawings, watercolor, photography, portraits and more has earned him the status of one of the most influential British artists of all time. Now 81 years old, the prolific contemporary superstar shows no signs of slowing down.